Pregnancy and tanning beds. Please don’t. I was reading some comments on a New York Times article about sun protection and one of the readers noted she was concerned about getting enough vitamin D for her unborn baby. She was using tanning beds 3 times a week to combat this problem. This is A) a useless way to get vitamin D; B) potentially hazardous to her life and C) could seriously jeopardize the health of her baby. Why? Apart from the very real risk of skin cancer. Tanning beds emit condensed UVA radiation at around 12 times higher than what you would get from natural sunlight. Some studies have indicated that UVA in concentrated doses may lead to breakdown of folic acid, an essential vitamin for fetal brain development. Not worth the risk. Vitamin D is derived from UVB rays. Tanning beds emit about 95% UVA. So to get a small amount of UVB, your body is subjected to a magnified dose of UVA. Not healthy. Pregnant women are more susceptible to sunburn and hormonal brown patchiness (chloasma). Overheating your body during pregnancy is not a great idea. I was talking to someone the other day who says she develops red bumps on her skin within minutes when she is in the sun. She said if she uses sunscreen it helps a lot but she still gets this rash. I told her to use a mineral sunscreen like zinc because it blocks UVA more effectively. Like most people (including myself a couple of years back) she had no idea what I was talking about.. I wondered how widespread her condition is? This particular lady was Asian with a dark complexion. Cause: Exposure to sunlight. Not serious. Symptoms: Itching, redness and hives on areas of skin within minutes of exposure to sunlight. Sometimes mistaken for sunburn, but appears quicker, and goes away within a day after sun exposure is stopped. Prevention: Use broad spectrum sunscreen (blocks UVA and UVB). Polymorphic light eruption: Common alergic reaction to sunlight. Not serious. Your medication may be causing a reaction on your skin when exposed to sunlight. You may be even be allergic to sunscreen. If so, try a sunscreen with zinc or titanium dioxide as the active ingredient. Cause: Increase in body temperature from hot showers, exercise, spicy foods, or panic/ high stress. Prevention: Basically, avoid being hot. Take cool showers with mild soap and wear loose, cool clothing. Don’t have too many covers on when sleeping. Prevention: As above, keep cool wear cool clothing, take cool showers with mild soap. Avoid any unnecessary creams or powders because they will make it worse. porphyria or systemic lupus erythematosus. Has anyone heard doom-and-gloom stories about the potential health dangers of teeny nano particles in their sunscreen? Well I have been concerned about that too so have been keeping my eye on a study by Environmental Working Group. Their latest report says that they expected to find some nasty issues with sunscreens containing nano ingredients BUT.. they actually find that nano products are much safer than any other sunscreen, and in fact they recommend sunscreens containing nano ingredients. As well as containing less harmful ingredients, they give 20% more protection from UVA than any other sunscreen. Hissyfit are taking sunscreen to a higher level. Go here to check out their website to see some more fantastic products. SunSCREEN vs SunBLOCK – different..
*Sunscreen and sunblock works differently. Sunscreen contains chemicals which absorb UV. Some people may have an allergic reaction to these chemical absorbers. Sunblock is a physical sun barrier which deflects the sun’s rays. Active mineral ingredients in Sunblock are titanium dioxide and/or zinc oxide. *SPF (Sunburn Protection Factor). The number on the label is basically a guide to the amount of protection you should have from sunburn. For example. If it takes your skin three minutes to develop a sunburn, and you apply SPF 15 (15×3=45) it will generally take you 45 minutes to develop a sunburn. Needless to say, the effectiveness of a sun cream is relative to your skin’s own natural sun tolerance, HOW MUCH YOU APPLY and to the intensity of the sun (time of day and distance from the equator). *SPF is a measure for UVB radiation only. There is now a labeling system for the level of UVA radiation protection. Look for the stars on the label. 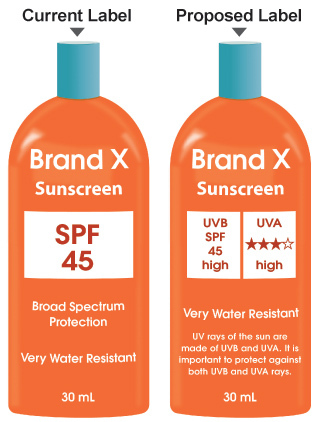 The UK is currently using a FIVE star rating and the US is proposing to upgrade labels to include a FOUR star UVA protection rating alongside the SPF. *Don’t skimp on the application!-The SPF coverage depends on how much of the cream is applied. Apply a liberal amount to the skin In order to achieve the effectiveness of the SPF on the label. UVA Rays: No Longer in the Shade. UVA and UVB: How they affect our skin. 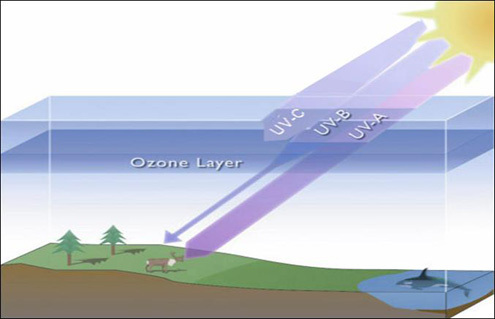 UVA are long reaching rays which are not absorbed by the ozone layer. Exposure to UVA radiation can contribute to premature skin aging and eye damage. UVA rays penetrate water, fog and clouds, so don’t be fooled by thinking you are safe from sun damage on a cloudy day! UVA rays can also penetrate glass. Take a look at the following pictures from a study on the La Roche Posay, Anthelios website. This teacher was facing her class so that the sun was shining through the window onto the left side of her face. UVA rays were penetrating the glass and damaging her skin. Look at the difference between each side of her face after 30 years! Recent proposals for changes to sunscreen testing and labeling in the US will hopefully give UVA radiation the recognition it deserves. Now, for those of you who think the aging effects of UV exposure is over-hyped, here is an interesting study which may change your mind.. The Good News About Skin Cancer. The Cancer Council of Australia says skin cancer is an almost entirely preventable disease. Most of the time a skin cancer is not life threatening if it is treated in time. Think of it this way; Skin is our body’s largest organ. We can’t see what is going on with other organs in our body, but we have the advantage of being able to notice many of the changes on our skin. The following table from the US National Cancer Institute, updated 21, February 2008, shows the estimated number of new cases and deaths for each common cancer type in the US each year. It is easy to see 1) how high the rate of skin cancer diagnosis is, and 2) how low the estimated death ratio is for skin cancer patients compared to other cancer types. Cancer basically starts out as an abnormal cell that divides and divides and can move or spread very quickly. Getting it sorted out as early as possible is extremely important. Here is a clip which explains what you should be aware of noticing when it comes to checking moles and freckles. We all need our leisure time and many of us couldn’t imagine a holiday without at some point being outside in the sun. It’s part of our life and wellbeing, right? Well so is looking after our health. We need to take precautions when we are enjoying holiday time and the outdoors. The following YouTube clip is sad and may frighten some people, but the message I would like to get across is that part of living your life to the fullest is looking after yourself and your loved ones. Don’t be afraid of the sun, but be aware that the sun’s rays produce UV radiation. It’s just common sense that we need to be diligent and take precautions when this radiation is in direct contact with our skin. *Stay out of the sun when it’s at its most intense- generally from 10am to 4pm. *Do a bit of research on your sunscreen/sunblock and understand how to use it. *Wear clothing that will protect you from the sun. *If you are on vacation and get sunburned by accident, absolutely do not re-expose that sunburned skin to the sun. *Keep an eye on the moles and freckles on your skin. If they change in size, colour or appearance, get yourself to a doctor that very day. Put your mind at ease. Don’t wait or be frightened because it could very likely be nothing serious, or it could be that your actions result in removal of an early threat.